You know, there’s a reason you don’t see as many movie games on the marketplace these days. The hastily put together projects often see rushed development cycles in order to coincide with the release of a feature film, and since the target audience isn’t exactly the “core” players who actually take the time to read reviews before making a purchasing decision, the quality of the final product frequently suffers. Because of this, I’ve stayed away from these lower-tier, fully priced titles over the past few years. That is, until Star Trek: The Game showed up at my door. Maybe my time away from games of this nature has allowed me to push their quality out of the corners of my mind and through my ears. That’s a possibility. However, I’m going to make the bold claim that Star Trek is just a bad game. Its murky presentation and cookie-cutter gameplay loops are difficult to defend, but the worst crime that Digital Extremes has committed here is making a stunningly boring game. It’s not broken, even if certain bugs forced me to restart checkpoints, and nothing about the voice acting is all that offensive. Instead, Star Trek just ends up being a difficult-to-swallow slog through unappealing hallways, coated in an uninspiring narrative. Star Trek picks up right after the ending of the 2009 film but before the beginning of the upcoming Into Darkness, meaning that the major issue that has to be addressed is the state of the new Vulcan planet. The dwindling race must be resettled in a fresh locale, but the sudden arrival of the vicious, reptilian Gorn species makes things a little bit difficult. Instead of simply calling a space U-Haul and moving all the pointy-eared hooligans to their new home, Spock and Kirk must grab their phasers and take down the scaly enemy. It’s a story with potential, but really, the Gorn just act as a hollow device to force constant combat. The two heroes travel from location to location, discovering both new forms of the alien race and infected humanoids with no control over their bodies. There’s cover to hide behind, new weapons to unload on enemies and cooperative maneuvers to partake in. It has everything your standard third-person shooter needs, expect that whole “fun” thing. Sadly, Star Trek is at its best when you’re holding the left trigger to aim and the right trigger to shoot. The handful of hacking puzzles never break away from being mundane, and the constant cooperative actions boil down to “help me with this door by pressing the “X” button!” The dimwitted AI doesn’t make the moment-to-moment action any better, either. You have the option of letting another human player join you, but if you can’t convince a friend to suffer through the Gorn invasion, you’ll be left with a companion that’s a few red shirts short of a full crew. My partner often traveled in circles as I called for his help, stood directly in front of me during heated combat scenarios and found a way to get lodged in the environment when making jumps. I had to restart my checkpoint on more than one occasion, and that led to a loss of progress I was unwilling to take. The graphical quality makes it a difficult game to watch, too. There’s a muddy nature to the faces of the characters, and the environments they explore could use a healthy splash of color. Alien ships are a brown mess, and the weapons the crew carries look like little more than clunky chunks of metal. Your skills with these armaments can be improved through constantly scanning objects via your Tricoder and applying the gained experience to a type of skill tree, but nothing about the game is so difficult to require improved attributes. Really, it can be fun to explore the world using the Tricoder’s Arkham City-like Detective vision, but when a visual alteration is one of the best features stuffed into a retail game, it’s safe to assume that there’s a problem. 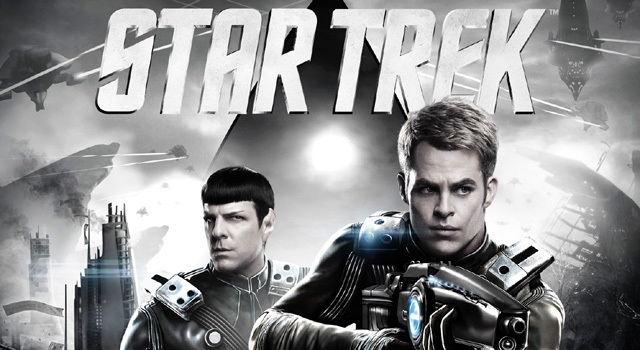 There’s no reason that Star Trek: The Game should cost $60. It has the length of a retail game, which I’d actually argue is another negative to put on the list, but there’s not a single, creative bone in its tedious body. I’ll likely still watch the movie when it hits theaters, but for now, I’ve had more than my fill of boldly going where much better games have gone before.